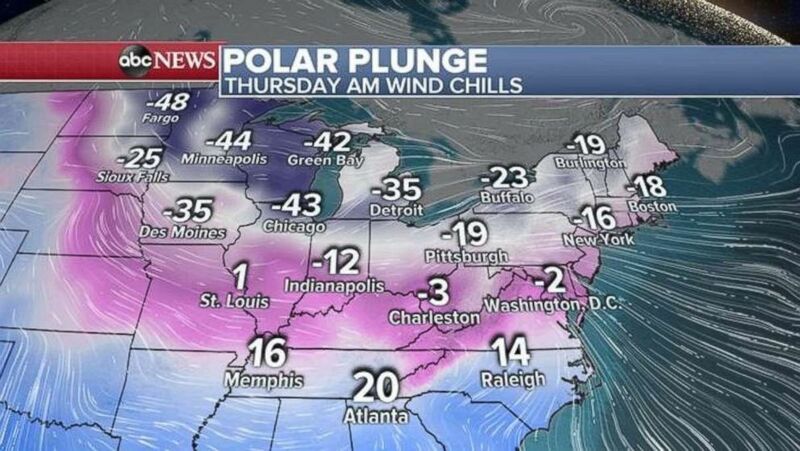 Brutally cold and extremely dangerous below-zero wind chills are paralyzing major Midwest cities. Chicago is forecast to reach an actual temperature of minus 26 degrees Wednesday night — just one degree away from the city’s all-time coldest temperature, which was set in 1994. And soon, freezing temperatures will take over the Northeast. The coldest wind chill (what it feels like outside) in the U.S. Wednesday morning was near Ponsford, Minnesota, which clocked in at a bone-chilling minus 66 degrees. Chicago’s lakefront is covered with ice on, Jan. 30, 2019. The sun rises over Lake Michigan in Chicago, Jan. 30, 2019. The temperature in Minneapolis plunged to minus 28 — the lowest since 1996. The city recorded a wind chill of minus 55. 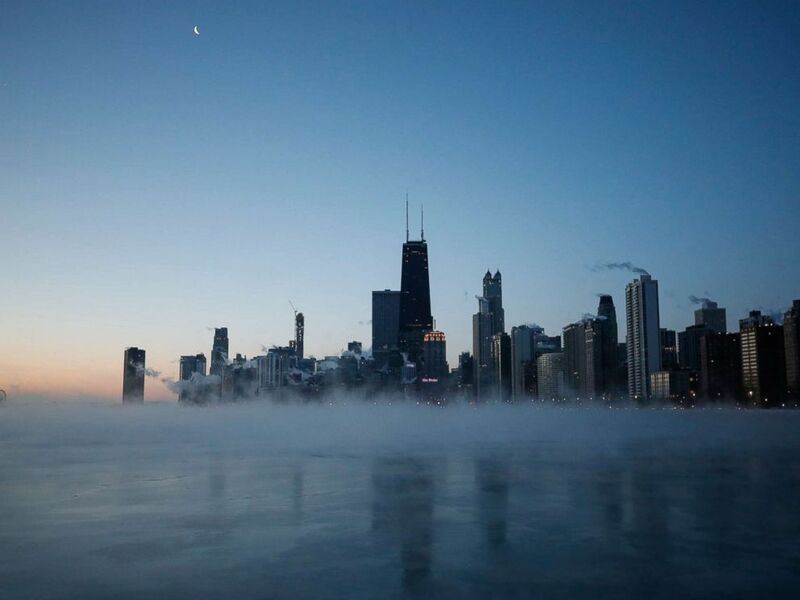 Chicago reached a temperature of minus 23 — the lowest there since 1994. 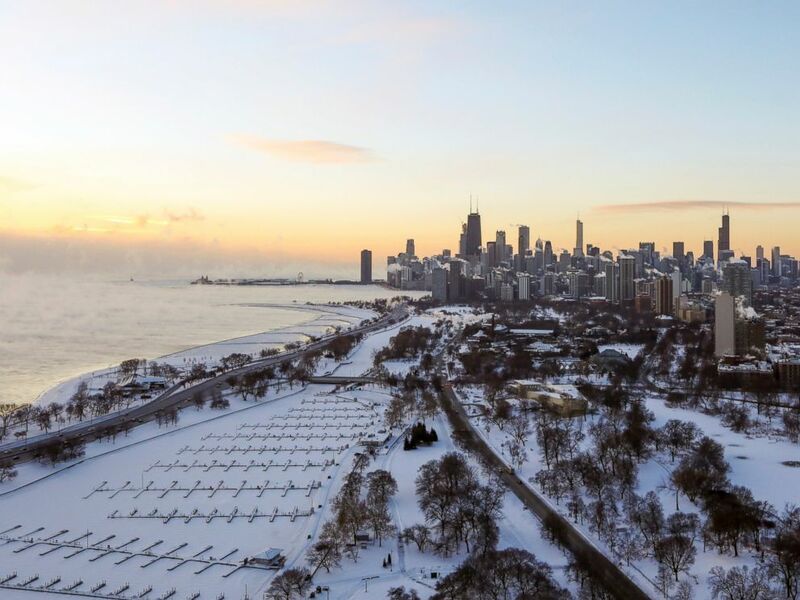 Chicago saw a minus 52 degree wind chill. As the cold takes over and residents are urged to stay inside to avoid dangers including frostbite, the U.S. Postal Service has suspended delivery for Minnesota, western Wisconsin, western Illinois and Iowa. Over 1,700 flights have been canceled at Chicago’s airports for the day, and Amtrak suspended all Wednesday trains to and from Chicago. Classes are even canceled at colleges, including the University of Chicago, Northwestern, University of Wisconsin — Madison and the University of Michigan — Ann Arbor. A commuter braves the wind and snow in frigid weather, Jan. 30, 2019, in Cincinnati. At least seven people, including two in the Detroit area, have died in connection to the dangerously cold weather, according to The Associated Press. In Libertyvile, Illinois, a man was killed by a snowplow, local police said. In Milwaukee, Wisconsin, a 55-year-old man was «cold and frozen» when he was found dead in a garage near a snow shovel Tuesday, a medical examiner’s office official said. Besides the seven people, a zebra suffered a cold weather-related death on a private farm in Indiana, according to Carroll County Sheriff Tobe Leazenby. Making this cold blast worse is that it’s lasting so long. Much of the Midwest won’t see temperatures above zero for well over 24 hours. By mid-day Wednesday, wind chills had only warmed up to minus 39 in Minneapolis, minus 44 in Chicago and minus 29 in Detroit. Thursday morning wind chills are forecast to clock in at minus 44 in Minneapolis, minus 43 degrees in Chicago and minus 35 in Detroit. The extreme freeze comes as whiteout conditions targeted the Dakotas to western New York state. DashCam — #Whiteout Graceville MN Windchill -56. Made it Home safe. Blizzard warnings are in effect in upstate New York and the Upper Peninsula of Michigan due to high winds and heavy lake effect snow. Several feet of snowfall is possible in parts of upstate New York where the heaviest lake effect band sets up. 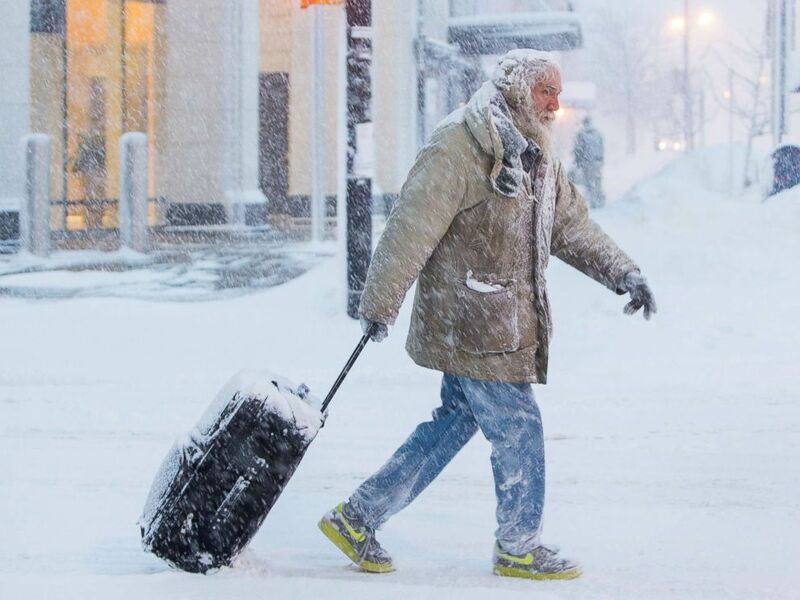 Man moves luggage in snow during a winter storm in Buffalo, N.Y., Jan. 30, 2019. 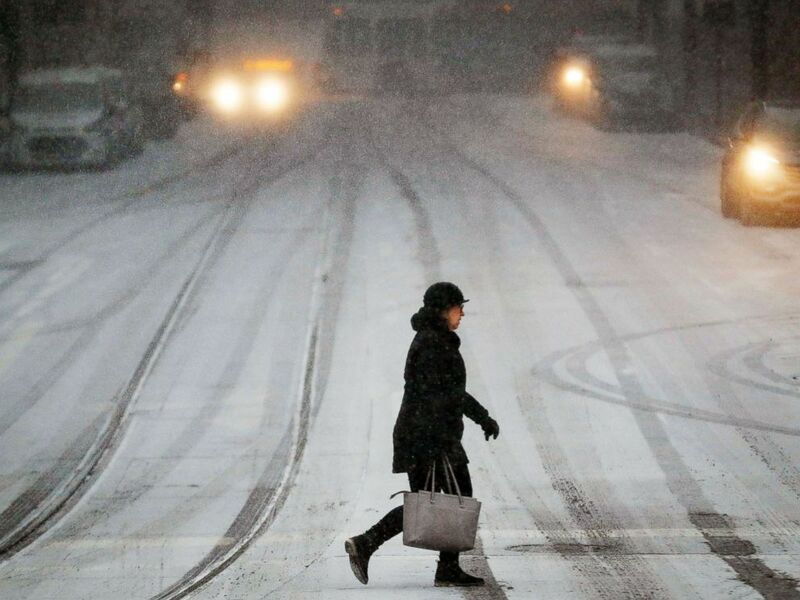 Snow squalls — sudden bands of snow combined with strong winds — were reported in parts of central Pennsylvania and New York Wednesday. Snow squalls create dangerous whiteout conditions, which feel similar to a blizzard but do not last as long. The cold air will next drift East. Thursday morning wind chills are forecast to reach minus 2 degrees in Washington, D.C., minus 16 in New York City and minus 18 in Boston. The cold will even extend to the South. Wind chills are forecast to reach 20 degrees in Atlanta, where fans are gearing up for this weekend’s Super Bowl. For the hard-hit Midwest, relief will return by the weekend, when temperatures in Minneapolis and Chicago will climb back up to the 40s. Super Bowl fans are also in luck: Atlanta is forecast to be in the 60s for the big game. 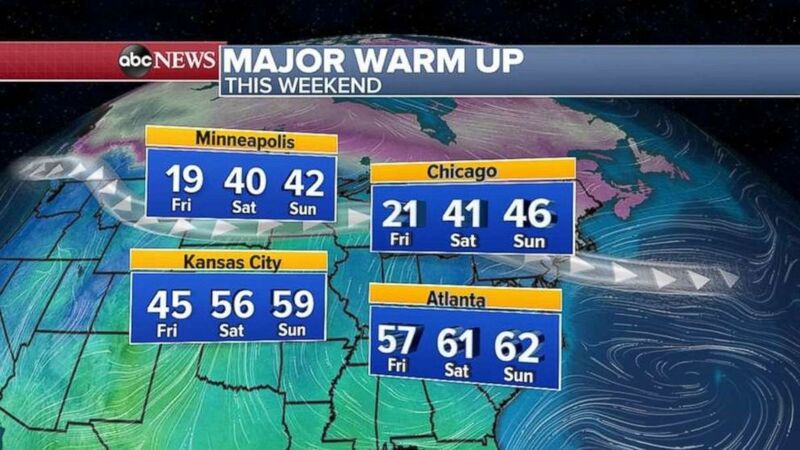 The cold temperatures will break by the weekend across the eastern U.S.
ABC News’ Christine Theodorou contributed to this report.